ON 06/06/2018 AT ABOUT 2000 HRS, A SEARCH OPERATION WAS LAUNCHED AGAINST THE NAXALS BY THE TROOPS OF 209 COBRA BN IN THE AREA OF KARRA AND KASRAULI, PS KUCHAI, DISTT SARAIKELA- KHARSAWAN (JHARKHAND). DURING THE OPERATION, THE NAXALS ALREADY CAMPING IN THE AREA STARTED HEAVY FIRING ON THE TROOPS. NO. 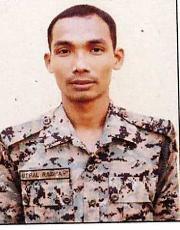 115135344 CT/GD UTPAL RABHA OF 209 COBRA BN EFFECTIVELY RETALIATED TO THE NAXALS FIRE WITH HIS WEAPON. UNFORTUNATELY, HE WAS HIT BY NAXALS BULLET AND SUCCUMBED TO THE SERIOUS INJURIES. AS A RESULT, CT/GD UTPAL RABHA LAID DOWN HIS LIFE IN THE LINE OF DUTY FOR THE CAUSE OF NATION.